Two teams are being honoured for their community-based research initiatives; the ‘Grand River Mohawk at McMaster’ project, aimed at preserving a unique dialect of the Mohawk language through a number of initiatives, including Mohawk and Cayuga themed baking lessons; and ‘We are Not the Others’, a play – rooted in findings from a research study – that focussed on giving voice to the challenges faced by immigrant women in Hamilton. Two teams of researchers were selected to receive the inaugural President’s Award for Community Engaged Scholarship. Mirna Carranza (Associate Professor, School of Social Work) and team members Nora López (Coordinator, Emergency Support Committee for Refugees), Ines Ríos (Executive Director, Immigrants Working Centre), and María Antelo (Coordinator of Community Development at the Hamilton Community Legal Clinic) received the award for the work they are doing with Hamilton’s newcomer communities on two related projects: Examining the Intersection of Immigrants’ Acculturation/Integration and Examining the Intersection of Immigrant Women's Acculturation and Mental Health). Rick Monture (Associate Professor, English and Cultural Studies & Indigenous Studies Program) and team members Ima Johnson (Mohawk teacher and Faith Keeper), Laurie Powless, Geeg Hill, Scott Longboat, and Amber Squire (Six Nations Polytechnic), and Kate Brown, Jill Rogers, John Hill, Clare Richardson, Mary-Ellen Simon, and Josh Dockstator (Indigenous Studies Program) have received the award for their work on the Grand River Mohawk at McMaster project. The selection committee was very impressed with the exemplary approach to community-engaged scholarship that both of these teams exhibit in reflecting a principled and mutually beneficial approach to their partnership efforts. And the School of Social Work is especially thrilled that Mirna and her team were recognized and honoured with this Award. Congratulations! 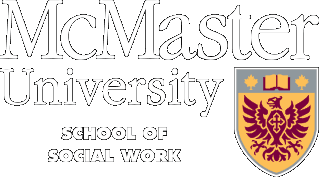 More details can be found on McMaster's Brighter World.